PUNE (New Delhi): The Supreme Court observed that there wasn’t need for punitive action to be taken against the directors of Volkswagen as the environment tribunal’s order on deposit of Rs.100 crore to the Central Pollution Control Board (CPCB) pertaining to use of a cheat device in diesel vehicles leading to flouting of emission norms had been complied with. A bench comprising Justices D.Y. Chandrachud and Hemant Gupta also found favour with expanding the judicial scope of the issue of using a cheat device in diesel vehicles to flout emission norms to other automobile companies indulging in the practice. The top court was of the view that the environment tribunal should have refrained from passing the order on making the deposit as it was already seized of the case. Accordingly, the court refused to stay the NGT order directing the German automobile company to deposit Rs. 100 crore to the CPCB. It was also made clear that all rights and contentions of the parties would remain open and Volkswagen could raise its objections to the expert committee before the NGT, which had recommended a fine of Rs. 171.34 crore on Volkswagen for causing air pollution in Delhi due to excess nitrogen oxide emission. Senior Advocate Abhishek Manu Singhvi, appearing for Volkswagen expressly, told the court that the company had been singled out on the issue. 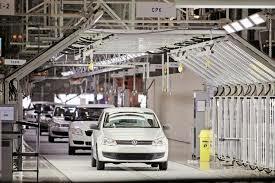 On 17 January, a NGT bench headed by chairperson Adarsh Kumar Goel had directed Volkswagen to deposit Rs. 100 crore within 24 hours in order to comply with an earlier order of 16 November, 2018. The automobile company was asked to give an undertaking for deposit of the amount by 5pm the same day. The court was hearing a batch of pleas against the German automobile company for violation of emission and pollution norms by use of a cheat device in its diesel vehicles. Volkswagen India had in December 2015 agreed to recall a total of 3.23 lakh vehicles in India in the wake of flouting emission norms after the Pune-based Automotive Research Association of India (Arai) found variations in on-road emission levels in diesel engine models sold by Volkswagen.